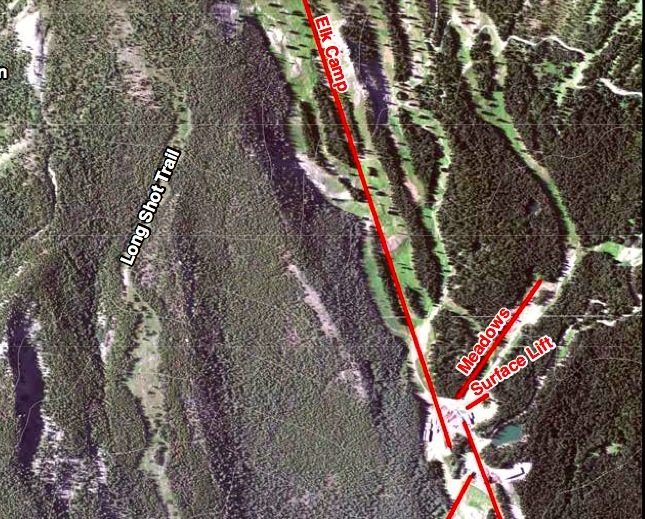 A USFS graphic of the Snowmass Ski Area from a 2013 study of Burnt Mountain shows the forested area above the Meadows lift where SkiCo is considering building an alpine coaster. SNOWMASS VILLAGE – When the Snowmass Resort Association, the town’s former marketing arm, proposed an alpine coaster as a much-needed ski area summer attraction, the public derision back in the 1990s resonated clearly throughout the upper Roaring Fork Valley. But as on-mountain coasters and slides have taken hold at other ski areas, the stigma may have lessened. A recent record of decision by the U.S. Forest Service about Vail Resort’s Epic Discovery project could lead to more recreational activities of this kind on federal land, including Snowmass Ski Area. Aspen Skiing Co. is looking at enhanced attractions as a way of boosting summer business on a mountain that last season saw disappointing numbers for the Elk Camp Gondola in spite of year-after-year investment to its summer trails system. The first test of the 2011 Ski Area Recreational Opportunities Enhancement Act, sponsored by Sen. Mark Udall, came in October when the U.S. Forest Service issued a record of decision that will allow more ziplines, about 50 miles of additional trails and an alpine coaster on Vail Mountain. This week, SkiCo shared with the town in an informal update session its own vision of an on-mountain summer playground that would have some of the same features as Vail: ziplines, ropes courses, a climbing wall and a mountain coaster, captured in a smaller, more Snowmass-like experience. A mountain, or alpine, coaster is a gravity propelled ride along a track, where riders descend in carts with their own braking systems. All on-mountain improvements are subject to an environmental analysis and site-specific approval by the U.S. Forest Service as well as planning approvals from the town. “Our intention is to integrate these activities into the forest stands in an aesthetically and environmentally sensitive way, minimizing disturbances and using natural material wherever possible, in a scale appropriate for the location,” said Dave Corbin, SkiCo vice president of planning and development. Corbin was among a team of SkiCo executives who spoke Nov. 17 to the Snowmass Village Town Council about the need to grow on-mountain summer business through more events, activities and enhancements. “We’re less than thrilled with gondola ridership, especially compared to the growth on Aspen Mountain,” said Steve Sewell, general manager of the Snowmass Ski Area. SkiCo has made extensive improvements to Snowmass’ mountain biking trails over the last three years. Their new plan seeks to expand offerings to younger families through fishing activities and a climbing wall, while continuing to improve the mountain biking trails network. Six miles of intermediate and expert trails are proposed by 2016 and SkiCo this year added a new beginner’s trail called Easy Rider. Future plans include an adventure course in the trees between Meadows and Turkey Trot. 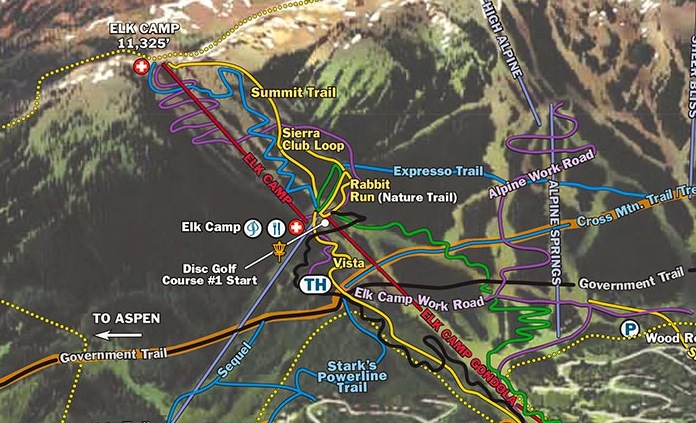 Source: / Aspen Skiing Co.
A detail of SkiCo's summer trail map of the Snowmass Ski Area. Winter Park has operated an alpine coaster since 1980. It winds 3,030 feet down the face of the mountain. “It is definitely one of the most popular of our summer activities,” said Steve Hurlbert, Winter Park’s director of public relations and communications. It’s the ski resort’s second most popular summer attraction, behind mountain biking, and believed to be a significant contributor in the 44 percent increase in summer business since 2006. “Certainly, the alpine slide is a big piece of that,” he said. Nancy Heard, general manager of the Glenwood Caverns Adventure Park, said the alpine coaster was the first attraction and in the mountain top adventure park’s 10 years it remains the biggest draw. It is 3,300 feet in length and drops 300 vertical feet. Located entirely on private land perched above the Colorado River, the caverns has been able to develop an on-mountain fun center without oversight from the Forest Service. “It’s by far our most popular ride, even with the addition of some traditional thrill rides and roller coasters,” said Heard. Its continuing appeal comes from it being open to those aged 3 to 93 and the fact that the passenger controls their own speeds and braking. SkiCo is said to be exploring buying the same equipment used at Glenwood Caverns for its Elk Camp installation that’s made by German company Wiegand Sports. Snowmass’ coaster would be located uphill of the Elk Camp Meadows teaching area in the tree stand between lower Sandy Park and the runout of Gunner’s View. Some 4,400 feet in length, it would descend 410 feet of vertical through a forested section. The ride could be as long as four minutes, Corbin said. Harmony with the natural environment is one of the directives of the 2011 Ski Area Recreational Opportunities Enhancement Act. Its others are that projects can’t adversely impact winter operations and that proposals be assessed on a case-by-case basis. The slide, as proposed, would be located in an area that could be closed from the skiing public. “Our programs and design will seek to engage and showcase the surrounding land and timber in connective, sensitive ways,” Corbin said. Opposition to amenities like coasters and ziplines has traditionally come from those who believe they offer little connection to the outdoors as a sense of place. The ski industry is still taking in the full impact of the USFS’s Vail decision. “The recent approval of Vail’s summer activities was the first the agency has completed and that proposal was actually years in the making,” Corbin said. Additional information was shared Nov. 14 during a meeting at Copper Mountain with White River National Forest ski area permittees, where the USFS described the process, lessons learned in Vail’s review, and the agency’s goals and criteria for summer activities on ski areas. “While we are all long schooled in the process and substance of winter recreation review, approvals and operations, summer recreation is a new subject for both the permittees and the agency and I expect we will all tread carefully in both the business and regulatory realms,” Corbin said. Snowmass’ view since the days Terry Hunt ran the Snowmass Resort Association were recalled when new councilman Bill Madsen responded to SkiCo CEO Mike Kaplan’s “sense of urgency” to make on-mountain improvements. Editor’s Note: Aspen Journalism and the Aspen Daily News are collaborating on coverage of Snowmass Village. The Daily News published this story on Saturday, Nov. 22, 2104.